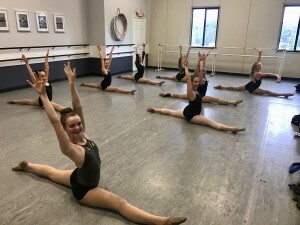 Sawnee Ballet offers multiple options for summer dancing fun! 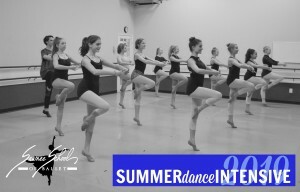 We have fun and energetic camps for dancers ages 3 – 18. Payment of 50% required upon registration. Balance due June 10th. If you have any questions, please feel free to contact our front office. Join us for a supercalifragelisticexpialidocious camp! 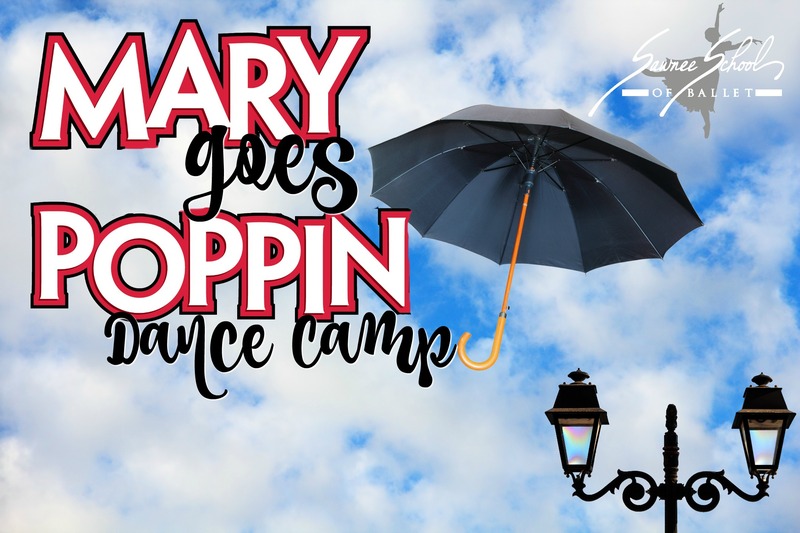 Campers will step-in-time to their favorite Mary Poppins’ songs. There is plenty of magic on the agenda, including games, snack, arts & crafts, and plenty of dancing! Campers will even make their own kite, so spit spot! The week will conclude with an informal performance on Friday at 12:00 pm. Dancers will need to bring lunch as well as a healthy snack and drink (please refrain from any products containing peanuts). Payment of 50% due at time of registration. Remaining balance due June 10. Come dance among the magical world of unicorns. A week full of rainbows, fairy tales, and dancing as kids learn to explore their imaginations through movement, sparkly crafts, games, and more! 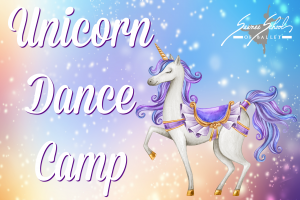 Each dancer will receive a unicorn headband on the last day of camp, which will also be worn for the informal performance on Friday at 12:00 pm. The camp is designed for each student to work at his/her own pace with harder skills being introduced as they progress. 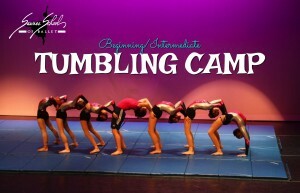 The tumblers will also learn to combine various skills in a short routine. Dancers will need to bring a healthy snack and a water bottle (please refrain from any products containing peanuts). Payment of 50% due at time of registration. Remaining balance due June 10. Dancers will take classes in ballet, contemporary, hip hop, jazz, and leaps/turns. This is designed for dancers that were in the primary and elementary ballet, jazz 1 and 2, and/or modern 1 levels during the 2018/2019 season (or will be enrolling in these levels for 2019/2020). 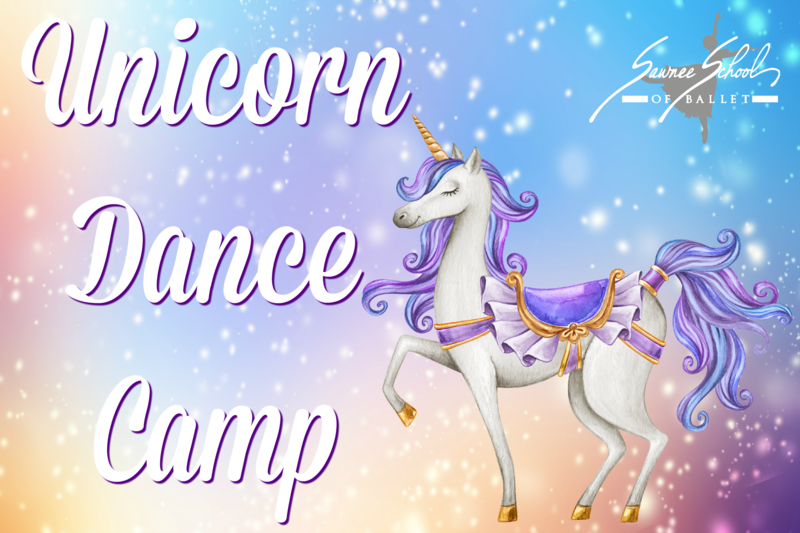 It is a great camp for dancers looking to try out several styles of dance as well as those interested in the Sapphires program. Dancers will need to bring a healthy snack, lunch, and water bottle(s). Payment of 50% due at time of registration. Remaining balance due June 10. 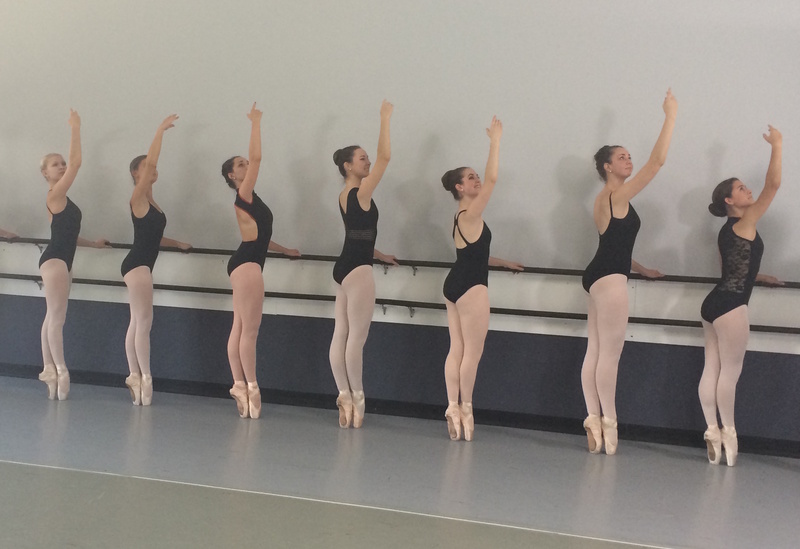 Dancers will take classes in ballet, contemporary, hip hop, jazz, leaps/turns and stretch/flexibility/conditioning. 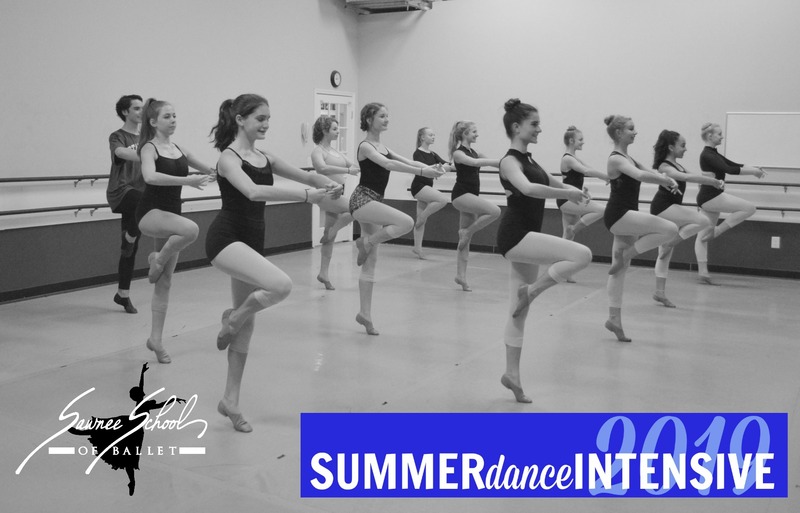 This camp is designed for dancers that were in the ballet levels Pre-Pointe, Beginning Pointe, or Intermediate Pointe during the 2018/2019 season or dancers new to Sawnee Ballet with similar experience. Non ballet option designed for dancers that were in Jazz levels 3 A, 3 B or 4 A and/or Modern level 3 during the 2018/2019 season or dancers new to Sawnee Ballet with similar experience. Dancers will need to bring a healthy snack, lunch, and water bottle(s). Discount for non-ballet option will be added by the front office after registration. Payment of 50% due at time of registration. Remaining balance due June 10. 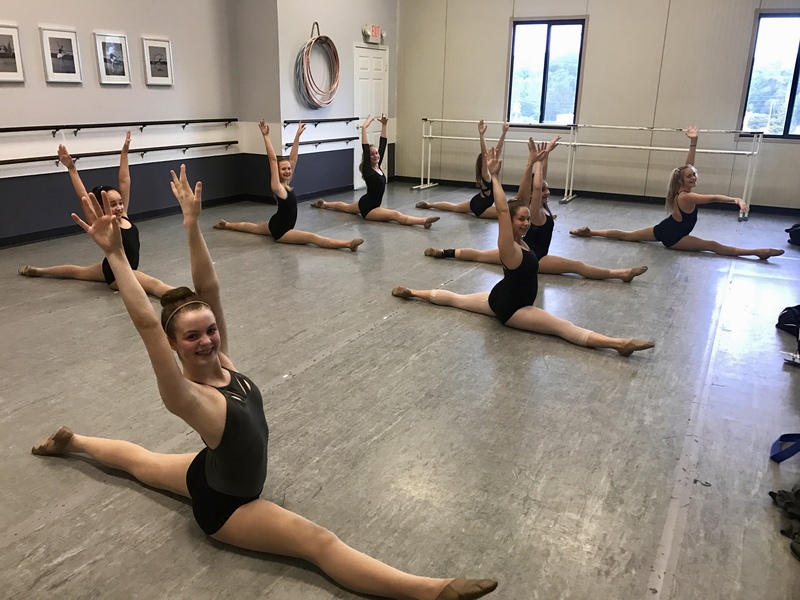 Dancers will take classes in ballet, pointe, contemporary, hip hop, jazz, leaps /turns and stretch/flexibility/conditioning. 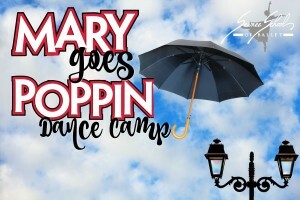 This camp is designed for dancers with either 3+ years of pointe experience, 5 years of jazz or contemporary experience, and/or were in SBT or FCHS Dance Dawgs during the 2018/2019 season. Dancers will need to bring a healthy snack, lunch, and water bottle(s). Discount for non-ballet option will be added by the front office after registration. Payment of 50% due at time of registration. Remaining balance due June 10. For both levels, this week will lend itself well to our experienced dancers as well as beginners. Dancers will be assigned roles based on level of experience and will be responsible for learning scripted rolls and choreography. There will be many lead roles as well as group sections for our novices who prefer safety in numbers. Dancers will also be asked to provide basic costuming needs from their closets. Shy about singing or speaking…no worries – it’s not a requirement! The week will conclude with Friday performances for family and friends. Dancers will need to bring lunch as well as a healthy snack and drink (please refrain from any products containing peanuts). “Oh the places you’ll go” and oh the “thinks you can think” by delving into the wonderful world of Seuss. 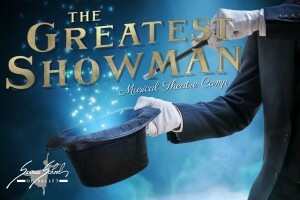 Performers will learn choreography and portray the characters from the popular Dr. Seuss books. Payment of 50% due at time of registration. Remaining balance due June 10. Based on the amazing soundtrack of the movie, The Greatest Showman, dancers will learn choreography to the music from the movie, character development and stage presence, while building the confidence to shine on any stage. Payment of 50% due at time of registration. Remaining balance due June 10. Increase your strength, flexibility and endurance with Stretch/Flexibility/Conditioning. This class focuses on student and teacher set goals for improvement with regular check points to assess progress. The class consists of warm up, static and dynamic stretching, conditioning exercises and a culminating cardiovascular component. Payment of 50% due at time of registration. Remaining balance due June 10. Add on the Aerial & Back Handspring Clinic from 2:00-3:00 pm for only $50. See below for more details. Taken in conjunction with the Stretch/Flex/Condition Mini Camp to warm up and work on the strength and proper technique needed for this clinic. 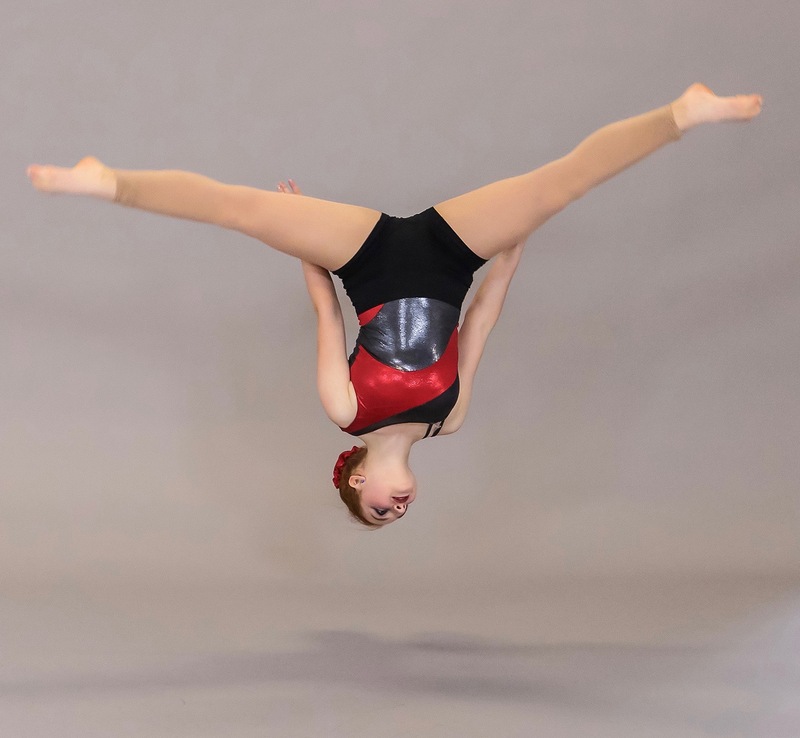 Dancers will learn the fundamental mechanics and momentum required for a running aerial and will gain a better understanding of the concept of being spotted. All dancers will learn how to spot one another so they may continue to practice to achieve this skill unassisted. Payment of 50% due at time of registration. Remaining balance due June 10.